Snow peas grow fast. It was just over a month ago that tiny stalks and little leaves started to shoot up. Now some of the plants are nearly three feet tall. 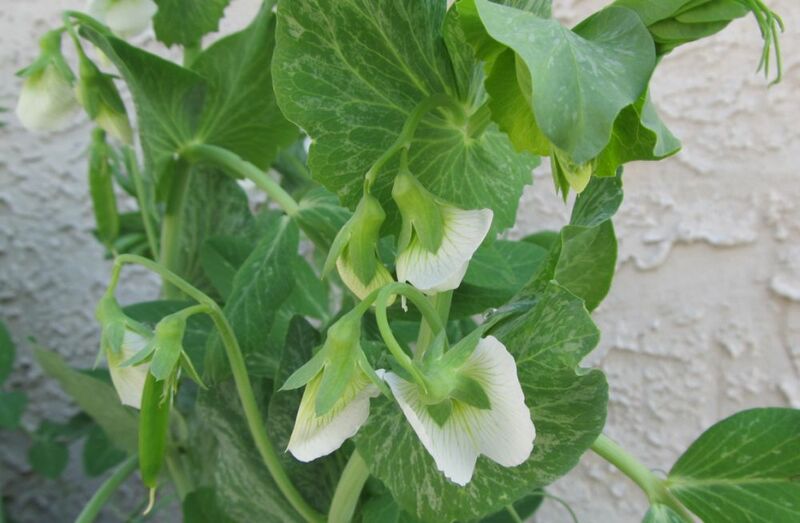 A few days ago I spotted the first flowers, and today the first two pea pods arrived. 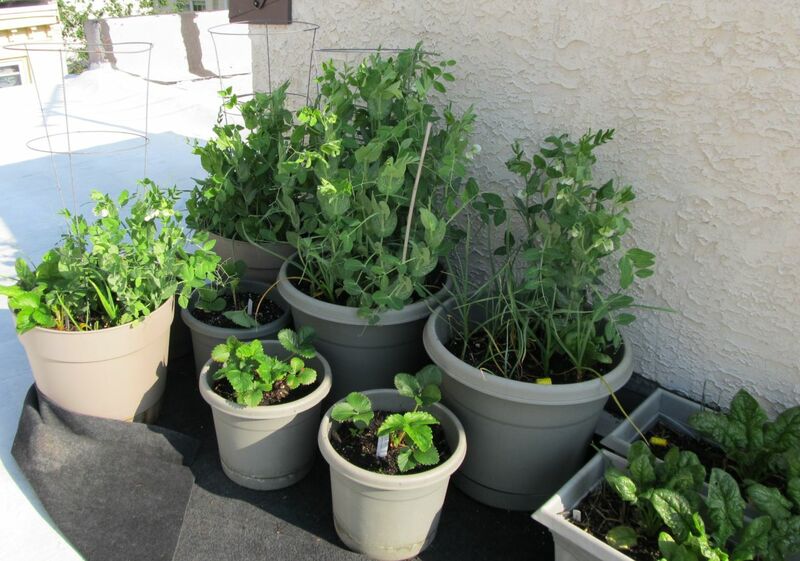 I’m growing snow peas in four containers, some more densely packed than others. Snow peas were by far my most successful crop in the rooftop container garden last year, so I decide to plant seeds without abandon this year. I expect a big harvest very soon and hopefully for weeks to come. Toward the end of May I’ll cut back a few of the plants to make room for peppers and tomatoes, and I suspect prolonged warm weather will start to kill off the snow peas by June anyway. 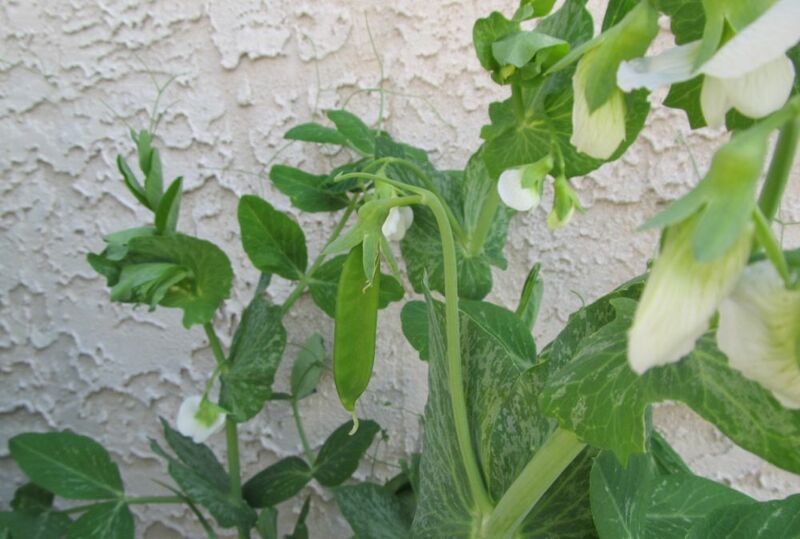 Because snow peas grow best in cool weather I’ll plant some more in August for a September/October crop. I don’t actually have any seeds left because I made the mistake of pre-sprouting every last snow pea seed I had before planting this spring. But I’ll try my hand at seed saving by leaving at least a few pods to wither and die on the vine so I have some new seeds to plant in the fall. I tried saving seeds last year but made the mistake of putting them in an air-tight jar before they had fully dried out. It turns out if you’re ever looking for a way to grow mold inside a jar, this turns out to be a very good method. The snow peas are under a mild attack by little leaf-sucking bugs which I think are a type of aphid. I occasionally spray them off with soapy water, but for the most part there are far more leaves than their are aphids so I’m not that worried about them right now. The fungus gnats are still a problem. I’ve tried watering the soil repeatedly with a mix of water and BT, but that hasn’t had much effect. I’ve also placed yellow sticky strips in the planters and watched as dozens (maybe hundreds) of gnats have jumped to their sticky doom. But there are plenty more gnats to take their place. For my next gnat control attempt I’m going to take a suggestion from organic gardening expert (and You Bet Your Garden host) Mike McGrath. He says that placing cat grass near the gnat habitat will encourage that gnats to dig in and leave the other plants alone. I’m sprouting some cat grass seeds right now and hopefully I’ll be able to put them outside in a week or two. In other news, the spinach appears to be enjoying the weather immensely. I suspect it will get too warm to continue growing spinach soon and the plants will send up shoots and start flowering. 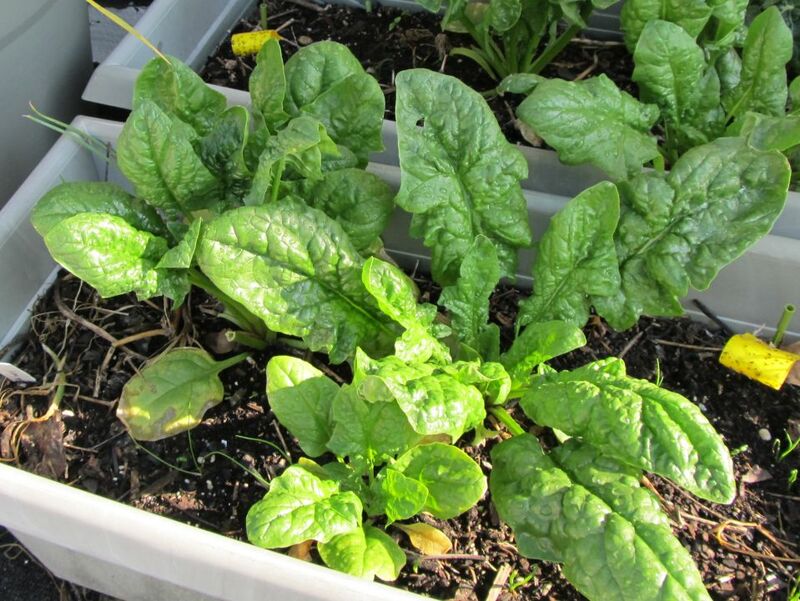 In the meantime, it’s nice to have a ready source of fresh spinach for meals once or twice a week on the rooftop. Ahh the devoted gardener in you! I'm envious I don't have a piece of land or a sunny window. Nice writing also. Not surprised. My "land" is the rooftop… there's a little space out behind the house, but it's surrounded by other houses and gets no light!